Many thanks to the almost 6,000 members of the public who took the time to complete our Landscapes3 public survey! The interactive, online survey was open for almost two months, and was conducted to help identify priorities for Chester County’s future as work continues on the next long-range comprehensive plan. The public survey is just one method of engaging residents and businesses as development of Landscapes3 advances. Stakeholder input, topic specific surveys, photo contests, presentations, and outreach at community events are also helping us to share information on what planning means for the future of Chester County, and to get feedback on what the public values. An upcoming opportunity is the first Landscapes3 public meeting — Oct. 26, 2017. More details will be released in the coming weeks, but mark your calendars now and check for details here. In this portion of the survey, participants were clear in their selection of Open Space & Environment as a very high priority. 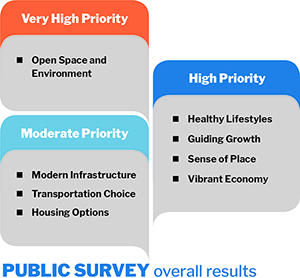 Healthy Lifestyles, Guiding Growth, Sense of Place, and Vibrant Economy were clustered together as high priorities, and Modern Infrastructure, Transportation Choice, and Housing Options as moderate priorities. After the priority ranking, participants could rank concepts within those topics they had identified as a top five. This consisted of a series of images that could be rated one through five, with five being most preferred. For example, Sense of Place provided images corresponding to Natural Resources, Scenic Features, Farms, Historic Structures, and Historic Villages. All received strong support, ranging from 3.987 for Historic Villages to 4.650 for Natural Resources. Overall, within all eight topics, Safe Drinking Water (under the Modern Infrastructure topic) was highest rated at 4.676, and Large Lot Estate Housing (within Housing Options) was lowest rated at 2.304. Other concepts that rated very high included Natural Resources (4.650), Nature Preserves (4.565), Strong Educational System (4.509), Forested Areas (4.496), and Stream Corridors (4.494). Detailed results from these ratings can be found in our full survey results. In addition to rating different items, participants could leave comments in different areas of the survey, and overall more than 9,500 comments were provided. These ranged from general support of farmland, parks, and affordable housing to targeted criticism of specific development types and roadway conditions. At times comments were at odds with the more general survey results. An example is transportation, which rated lower in overall importance in the initial ranking, but which generated significant feedback through comments. One area of the survey that generated a significant number of comments was the mapping exercise. Participants could mark the approximate location of their home, as well as locations that were a “thumbs up” or a “thumbs down,” with a pinpoint. Approximately 3,000 participants provided a pinpoint for their home, while just over 6,700 “thumbs up” were noted and fewer than 2,900 “thumbs down” were noted. These pinpoints could be categorized by topic (such as transportation or housing), and comments could be noted. Within each of these map marker types – home, “thumbs up”, and “thumbs down” – a pinpoint was left within each township, borough, and city within Chester County, reflecting the geographic diversity of those who completed the survey and the locations they wanted to raise up as a challenge needing improvement or point out as a success. More details on the public survey results can be found here. If you are interested in comparing input from the public survey with input previously provided through topic specific surveys, a summary of those survey results can be found here.